Umbria, which I visited a few of weeks ago, is a land-locked region in Italy where the Apennines rise above an otherwise hilly landscape. Located in the center of the peninsula, Umbria has many fine cities like Perugia (center of Italy’s chocolate industry) and Assisi (with its Giotto frescos). 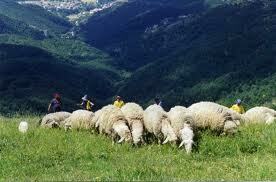 But it has as many sheep as people, and fine pecorino (sheep’s milk) cheese dominates the gastronomy. This part of the peninsula lies in the middle of the area occupied by the Etruscans, and many Umbrians describe themselves as Etruscan descendants. (All you history buffs, don’t shoot me; I’m just the messenger.) And they say their cheese mirrors Etruscan traditions. Be that as it may, before the rise of the Roman republic, Umbrian shepherds tended their flocks in this hilly region and produced a cheese from the sheep’s milk. The herds wandered over the pastureland during the summer months, then returned in August to villages for cheese making. It was a time of warring tribes, and somewhere along the way, the nomadic Umbrians learned to hide their food—ham, salami, and especially cheese—in fosse (caves and trenches) in the ground to protect them from being confiscated by tribal foes. When peace returned, the Umbrians discovered that the cheese thus stored and aged underground tasted better than cheese aged above ground and adopted this method as the norm for cheese production. In some parts of the region, the fosse are carved in volcanic rock, but in the region around the Monte Cucco park, the fosse are formed by bedrock. In both cases, the process is the same. Straw is burned to rid the space of insects and other unwanted vermin. Then a layer of clean straw is spread on the floor of the fosse. The cheese, wrapped in cloth, is arranged on this bed and covered by another layer of straw. The openings to the fosse are sealed with mud and/or mortar. 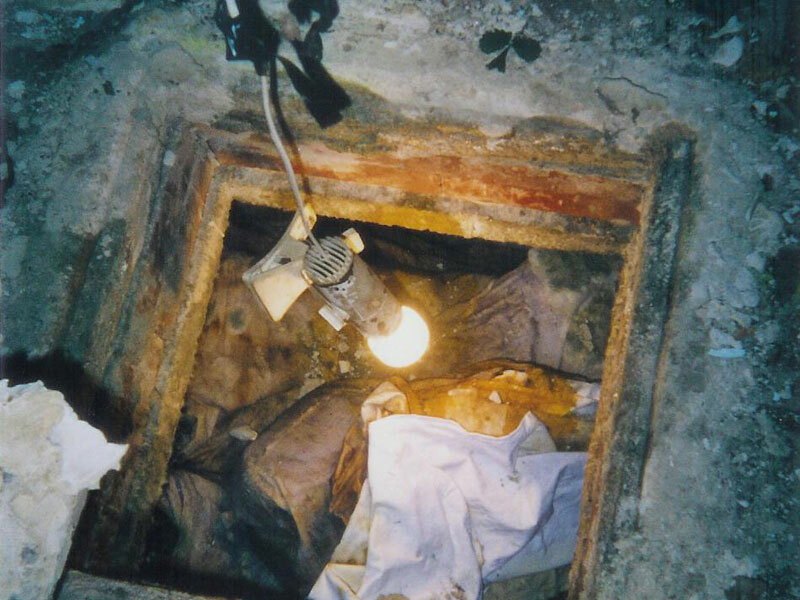 The underground fosse maintain a constant temperature that allows the cheese to age uniformly and naturally. This production method has been documented since 1581. 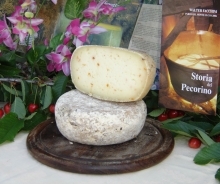 Today the pecorino in fossa is produced by small factories such as Caseificio Facchini Walter in Sigillo which has been operating since 1985. Signore Facchini died earlier this year, but his widow and children continue the tradition. Many cheese makers believe that the diet of the sheep contribute to the taste of the milk and thus of the cheese. 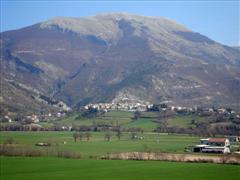 The Umbrians say that their sheep, grazing as they do on the fresh grass and herbs of the mountains, produce a pure flavor. The newly made cheese is often flavored with hot pepper or truffles before being placed in the fossa. Sometimes, the cheese is wrapped in fig leaves or rubbed with olive oil. I feel fortunate to have sampled the pecorino in fossa of Sigillo in several forms. I’m even more fortunate to have a few pieces vacuum wrapped in my fridge to serve my guests a bit later in the year.